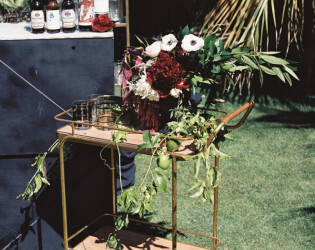 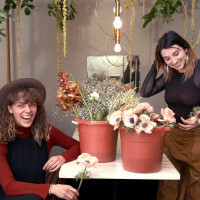 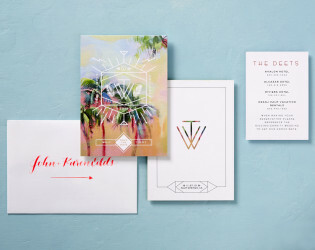 Floral Design: The Dainty Lion Floral Co.
Come to Colony 29 where paradisiacal pool party meets intimate Indian Canyon affair - offset by beautiful botanicals. 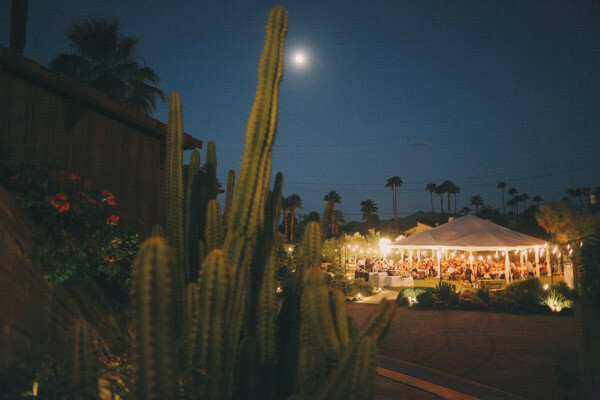 Colony 29 includes 6 free-standing homes spread across the 7 acre estate, all available as vacation rentals or command the commune for your elegant and intimate wedding, reunion or professional pow wow. You'll be lost... and found on the winding trails amid beautiful species of succulents and sweet flora & fauna. 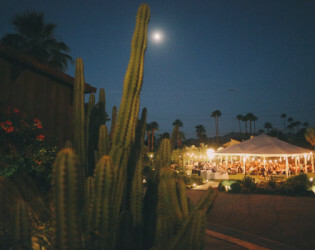 Called the "last best place in Palm Springs" because of it's tranquil locale, iconic architecture and panoramic views. Go off the beaten path for your Palm Springs pool party. 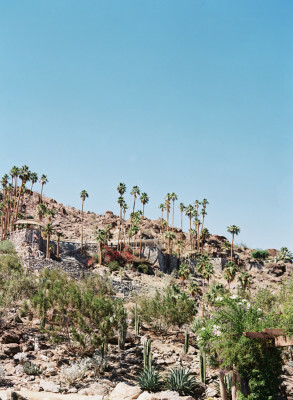 Something tremendously novel and exciting has descended upon the picturesque Palm Springs landscape. 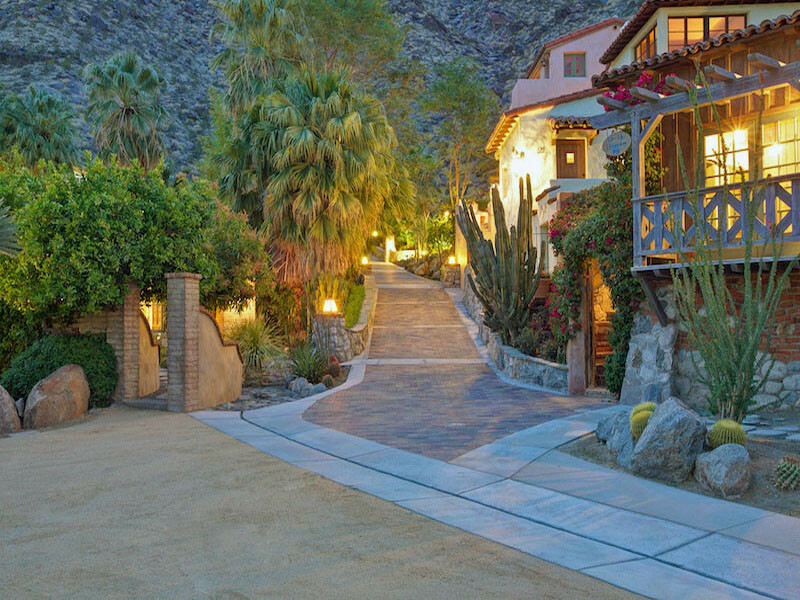 Nestled inconspicuously along the San Jacinto Mountains, rests an apex luxury destination. 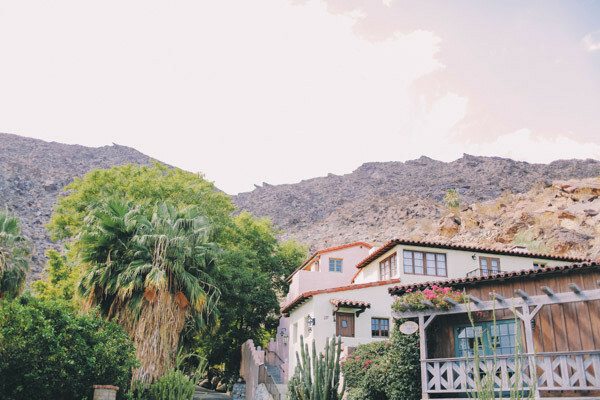 Welcome to Colony 29.Set on almost 7 acres at the very birthplace of Palm Springs, Colony 29 is a true village. 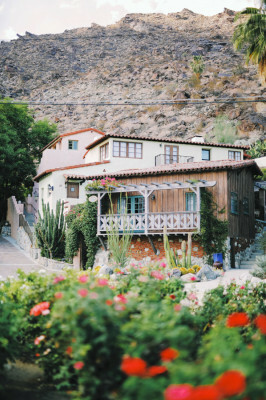 Six separate & distinctive homes originally built from 1929 to 1937 have been masterfully restored and modernized with the loving hand of a craftsman.McLean Company Rentals recent inaugural launch of this sprawling Spanish Villa (as a vacation rental, special events venue and destination experience), has opened a hidden, historic wellspring of creative inspiration to the public.From a private, paved road, you enter Colony 29 through ornate gates and the road meanders up the magnificent hillside. 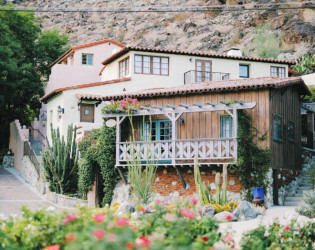 You will immediately note the picturesque setting reminiscent of a hillside European village. 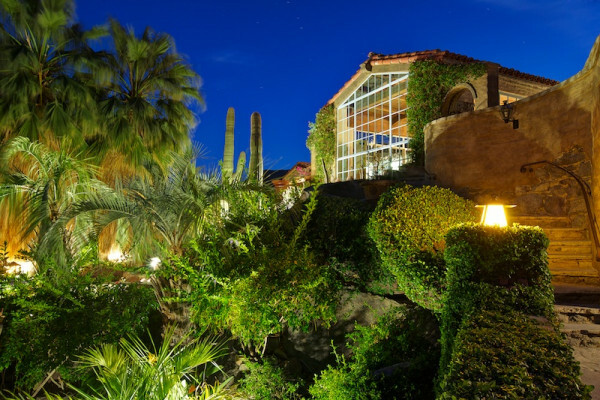 The grounds of Colony 29 abound with rock walkways and weave throughout the mountainside estate. 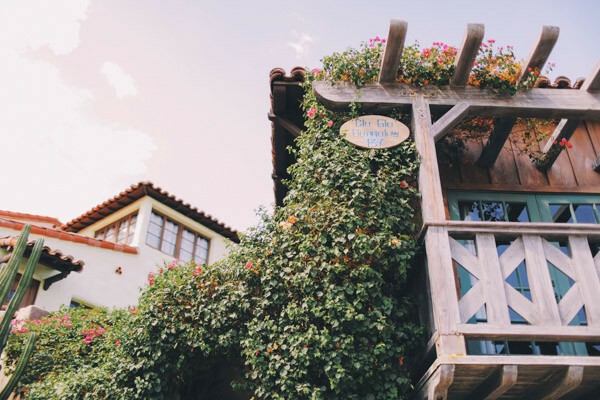 At each turn, a new surprise unfolds; a swimming pool, a meditation garden, an outdoor cast iron bathtub and massage area, a tree house or outdoor kitchen. 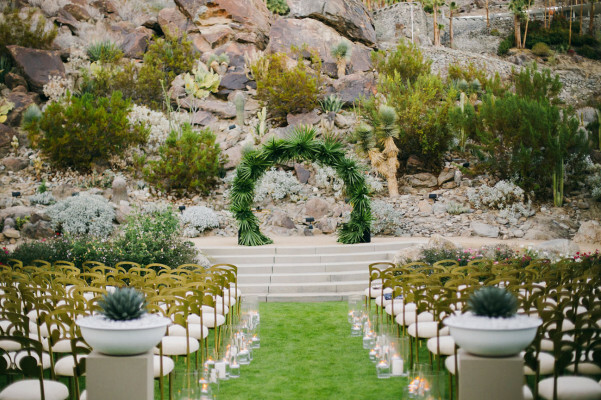 Bridges are positioned over dry streams. 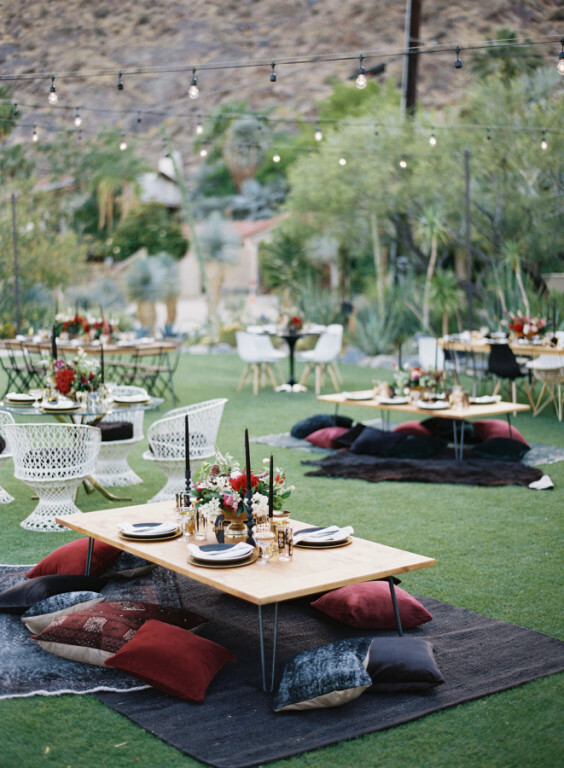 Covered patios are brought to life with ornate vines. 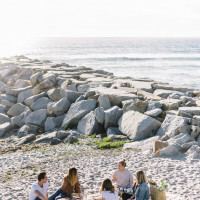 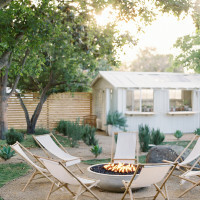 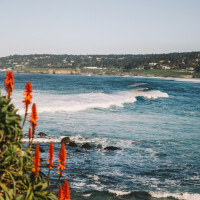 There are also outdoor fireplaces, spas and an endless sampling of the most beautiful specimens of California-native plant scape to be found anywhere. 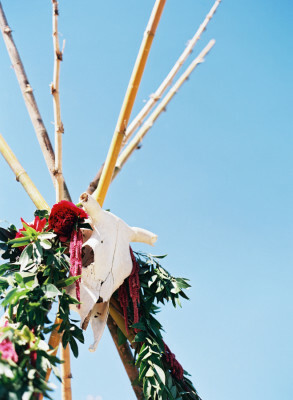 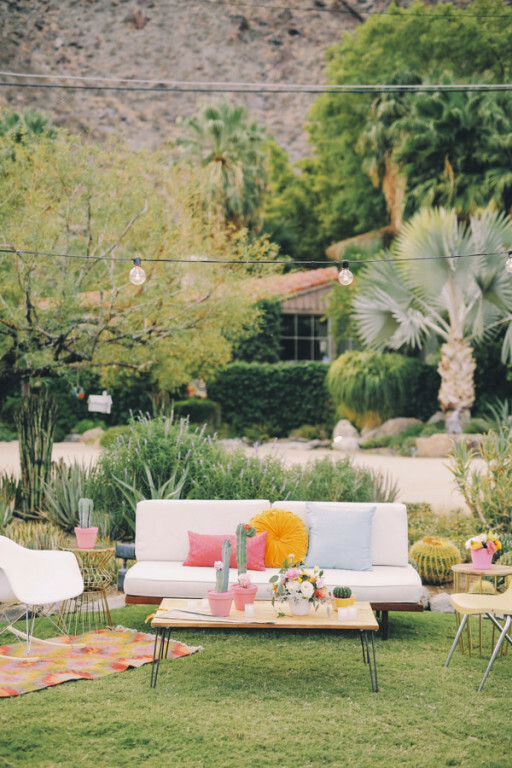 Desert flowers flourish with exotic palms. 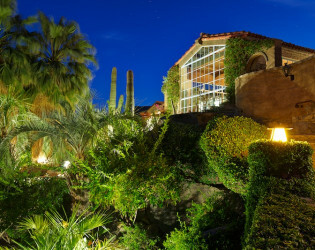 Walkways are framed with foliage that opens to many hidden treasures as you take in the expansive private gardens. 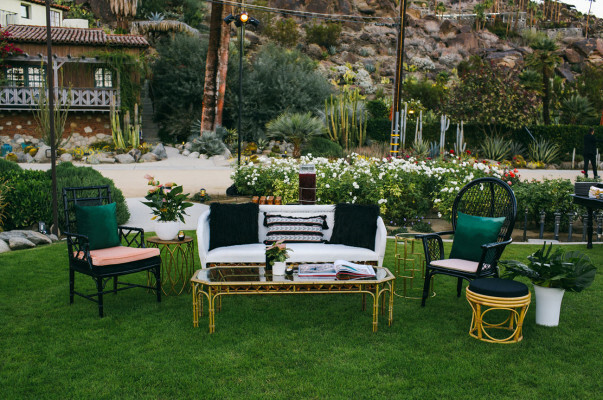 These gardens create an impressive outdoor living in addition to the amazing homes of Colony 29! 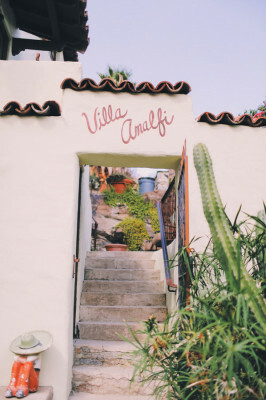 A labyrinth of stone pathways crawls up and across the mountainside, each turn revealing an unexpected view; gardens of cacti and agave; citrus, guava, mango, and banana trees; outdoor tubs and fireplaces; a barbecue and fire pit terrace; a grotto lined with grape vines; and intimate alcoves perfect for reading, meditating, or just enjoying the view. 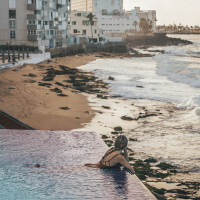 An adult sized, palapa tree house is large enough to host a small party and high enough to provide views across the city to the mountains beyond. 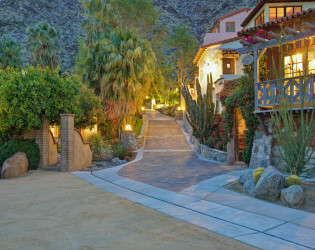 The grounds of Colony 29 abound with rock walkways and weave throughout the mountainside estate. 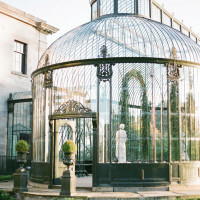 Above it all sits the two story main house, built in the mid-1920s by artist John Burnham, the son of Chicago based architect Daniel Burnham, renowned for his work as supervising architect of the Chicago Worlds Fair and for designing numerous early sky-scrapers. 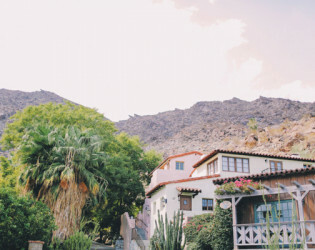 The younger Burnham is notable not so much for his modest artistic talent, but more for starting an artists colony on this Palm Springs property in the late 1920s. 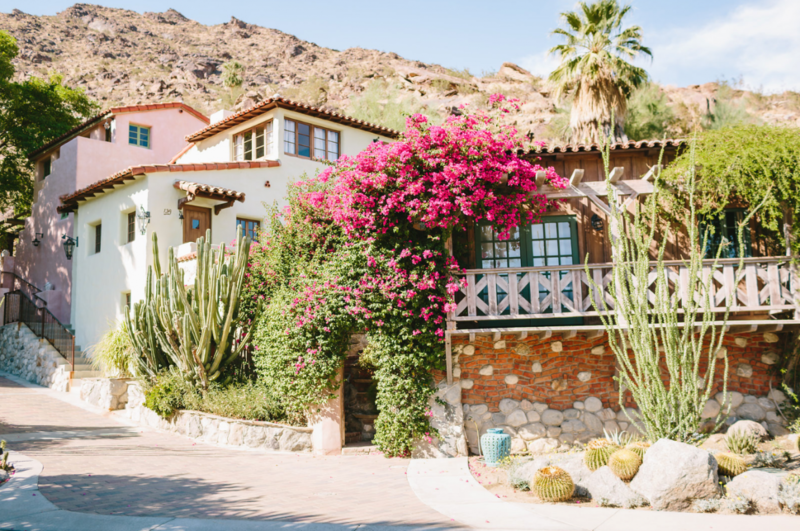 Enter the main house through a front courtyard, with fireplace and garden, into a great room with massive beamed ceilings, a natural rock fireplace, slate floors, Malibu & Catalina decorate tiles and famous glass walls that overlook the city of Palm Springs. 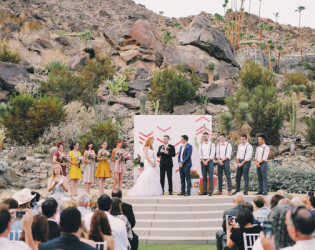 Mountain and city views will immediately astound you. 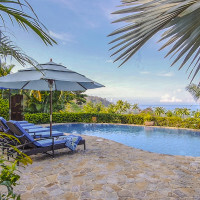 There are a total of 5 bedrooms, 4 baths, 4 fireplaces, two patios, built in outdoor bar and barbecue and saltwater pool and spa. The main house features two master suites, upstairs and down. 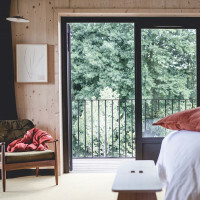 There are two additional guest bedrooms upstairs and an additional guest bedroom downstairs, with custom built twin bunk beds, perfect for kids or adventurous adults. 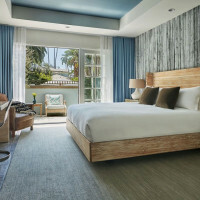 Both downstairs bedrooms have direct access to the pool and spa. 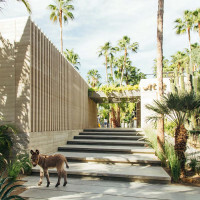 The landscaping is a functional design element adding not only beauty, but also adding privacy, transitioning the desert to semi tropical to full on tropical. 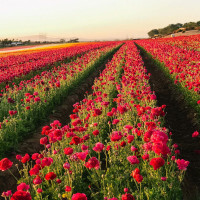 There are all also different gardens in transition. 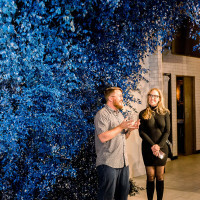 One is blue: blue cactus, blue agave, blue everything. 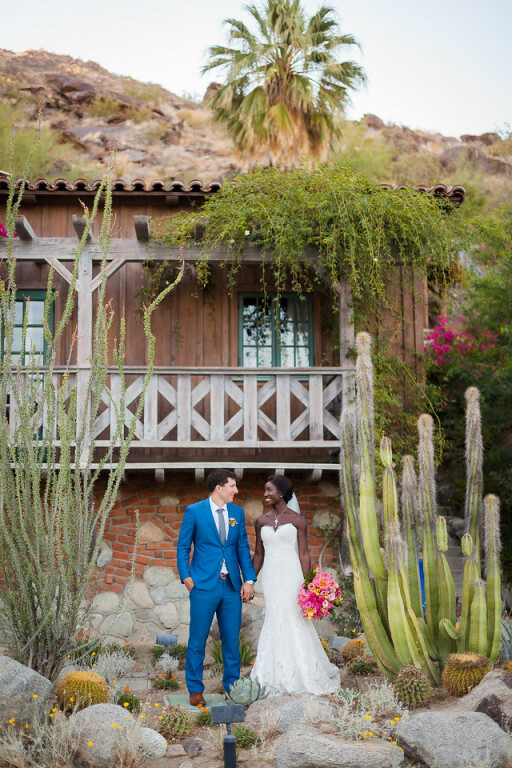 Below that are citrus trees. 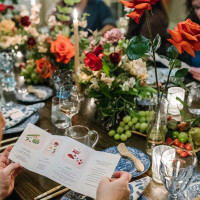 There are tomatoes, peppers, nine different varieties of grapes. Incredible mountain views from both patios, great room and upstairs master bedroom. 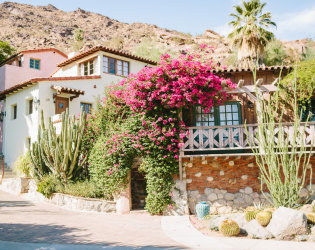 A total of 5 bedrooms, 4 baths, 4 fireplaces, two patios, built in outdoor bar and additional BBQ and outdoor dining area. 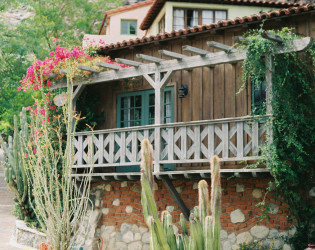 Includes a custom built Palapa tree house patio. 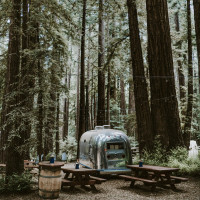 5 Flat Screen TV’s, 5 DVD Players, Stereo & WIFI. 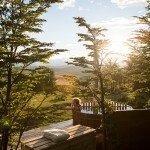 Beds: 3 – Kings, Queen, Custom Twin Bunk Beds The other 8 bedrooms and 9 baths are contained in 5 separate guest houses: Carved into the bottom of the hill, are two separate venues totaling over 12,000 square feet, built in stage, outdoor lighting and sound, parking for 85 cars, all settled on nearly 7 acres with breathtaking, towering mountain views. 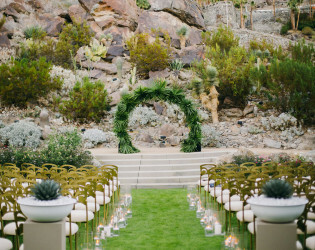 A perfect drop back for your wedding. 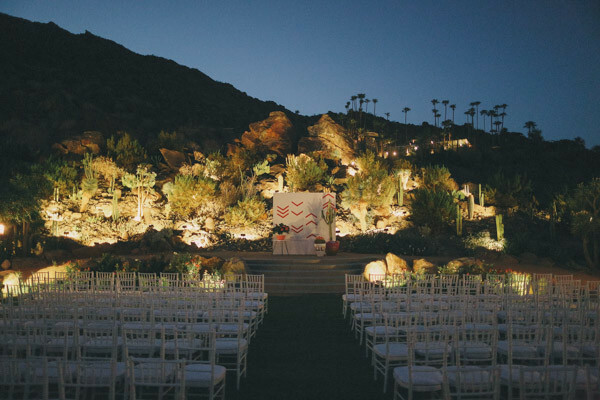 The private outdoor amphitheater is flanked by custom gazebos, professional lighting, and several expansive, and a lush green lawn. 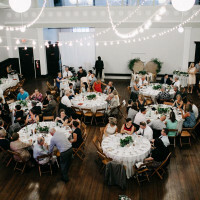 Just adjacent you will find another, second even larger by 1500 square feet venue. 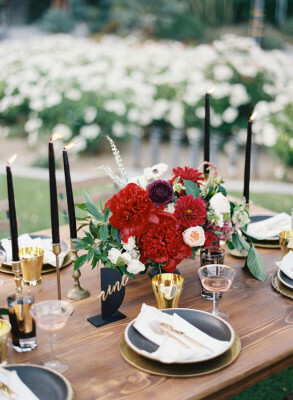 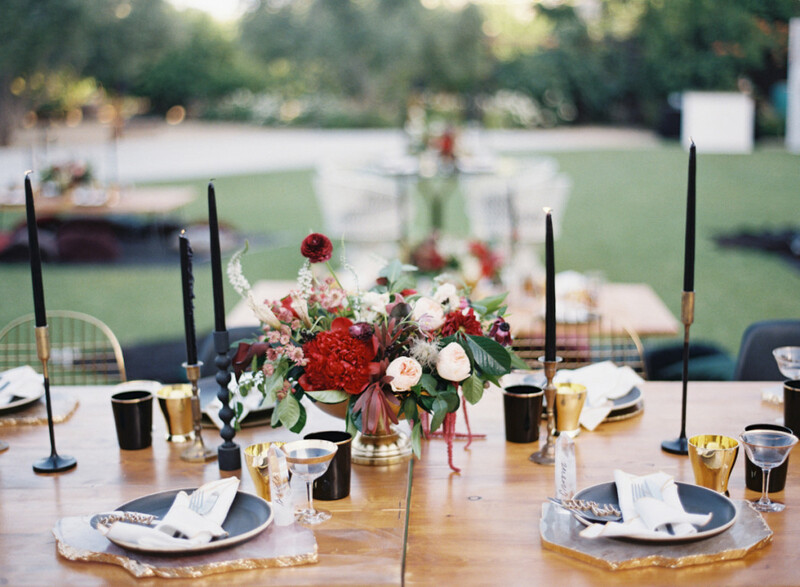 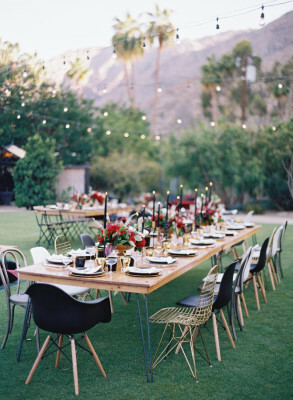 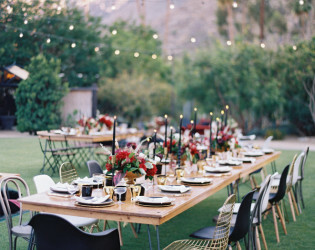 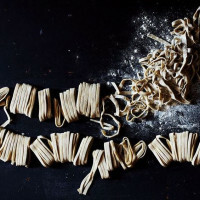 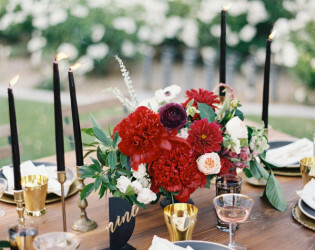 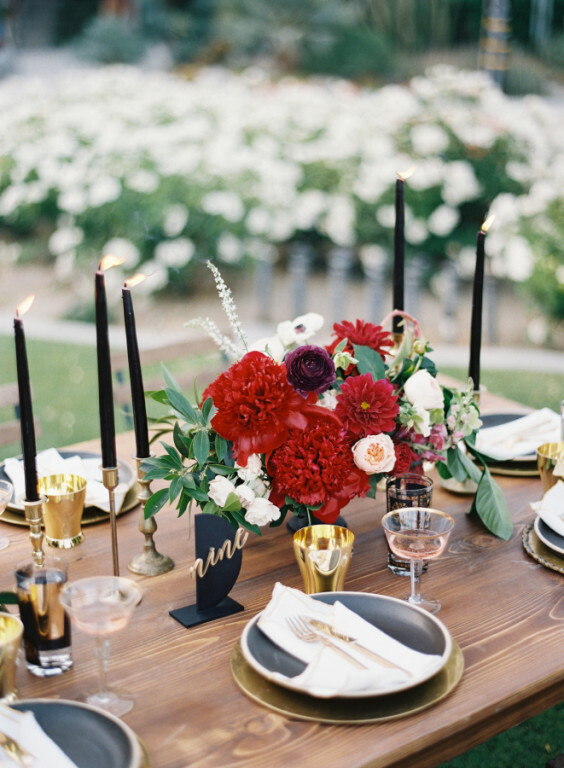 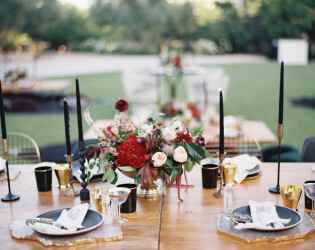 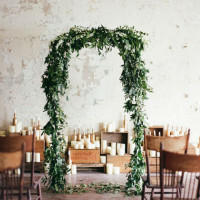 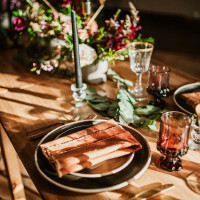 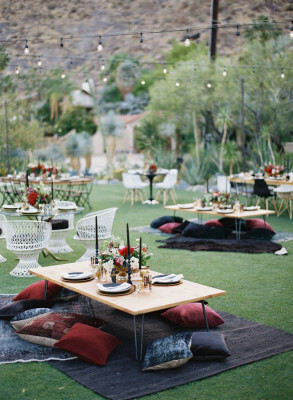 So multifunctional, this venue would make the most seasoned of events planners blush. 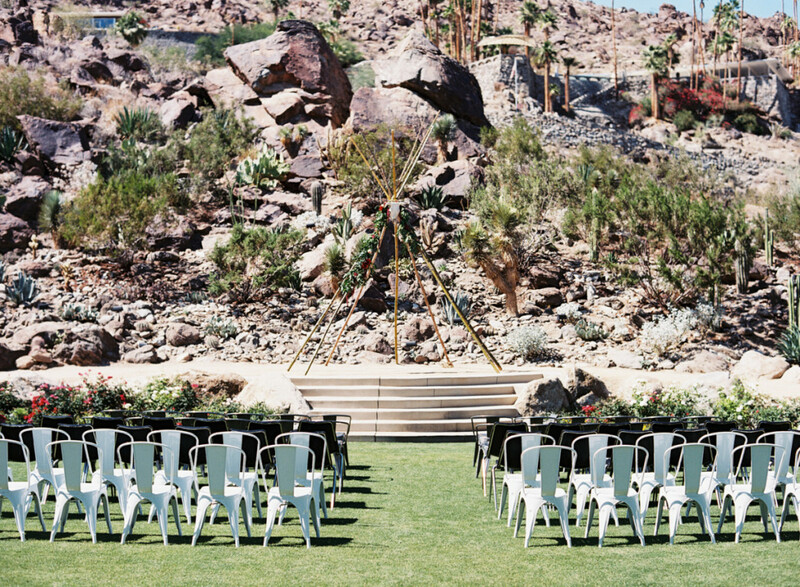 Combined seating for weddings from 100-500 people and onsite parking. 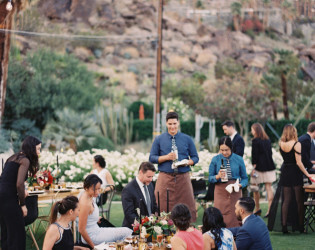 What better way to execute memorable weddings, corporate retreats and engaging business conferences, than deep within this extremely private oasis. 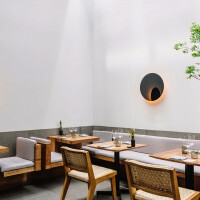 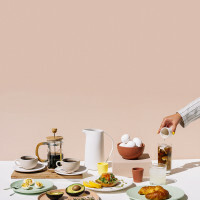 Palm Springs is a mecca of style and tranquility, as attested to by some of Hollywood’s most notable luminaries and millions of savvy travelers from around the world. 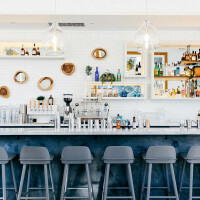 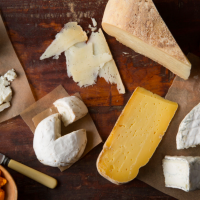 Colony 29 strategic location puts your whole group within walking distance to the unforgettable flavors of downtown Palm Springs. We require a 3-night stay minimum with a full buyout of the property. 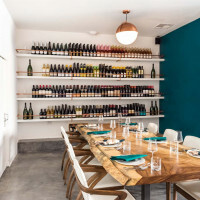 Pricing includes occupancy tax and event fee. 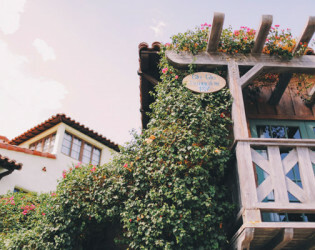 6 houses with 13 bedrooms in total. 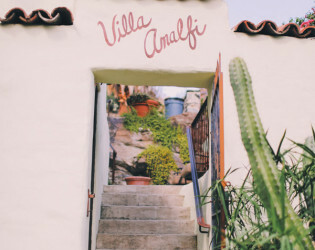 The property can sleep up to 26 people. 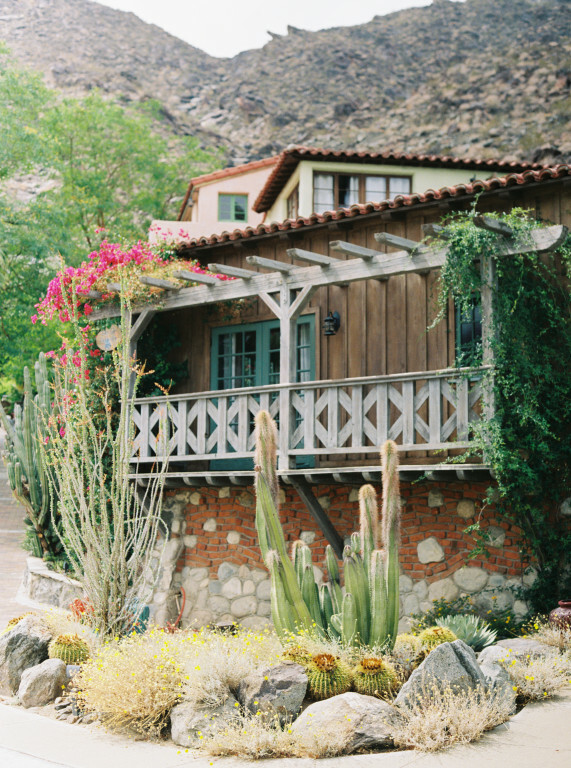 Colony 29 sits on 6 acres and is nestled inconspicuously along the San Jacinto Mountains. 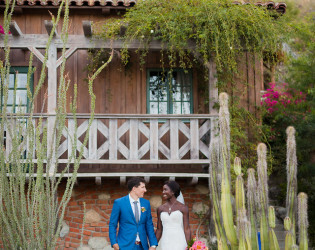 The picturesque setting is reminiscent of a hillside European village. 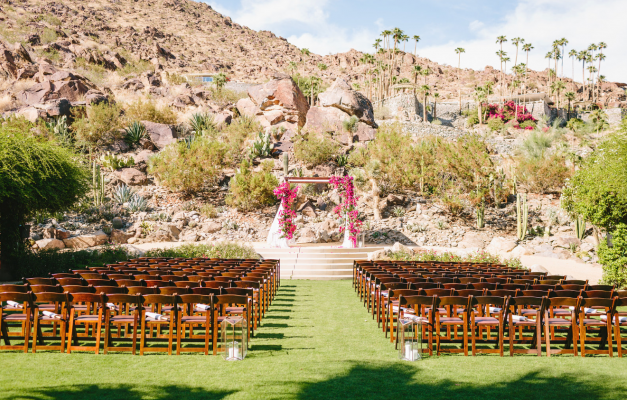 Carved into the bottom of the hill, on which the estate sits, are two separate venues you can choose from - an outdoor amphitheater and a multi-functional facility. 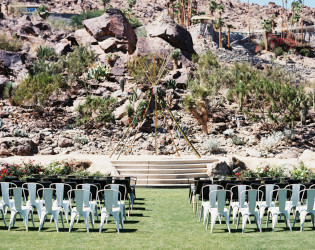 The private Outdoor Amphitheater boasts custom gazebos, professional lighting, and an expansive verdant lawn. 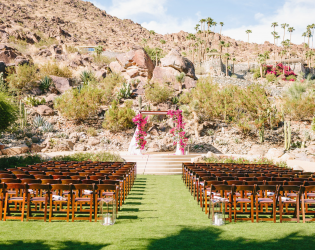 The towering mountain views provide a perfect backdrop for your serene, outdoor ceremony. 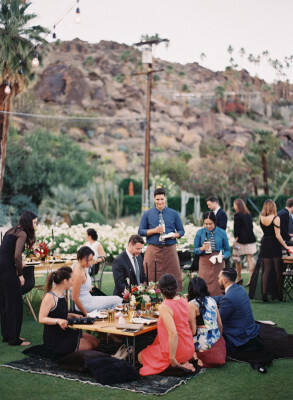 Host an outdoor reception under the stars or opt for an event tent on the lawn. 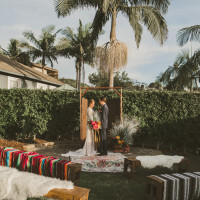 Rock walkways, footbridges, ponds, covered patios with ornate vines and native California plants provide scenic settings for your wedding portraits. 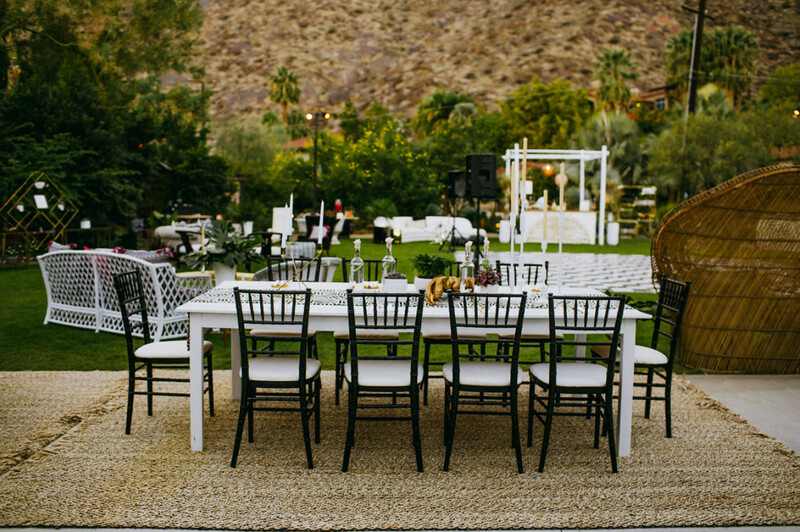 The spacious, multi-functional, indoor facility is a blank canvas that can be transformed to reflect your personal styles and tastes. 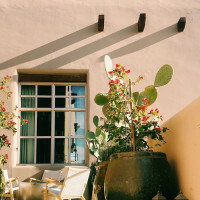 The indoor space features Spanish-style roof tiles, high ceilings, and floor to ceiling windows. 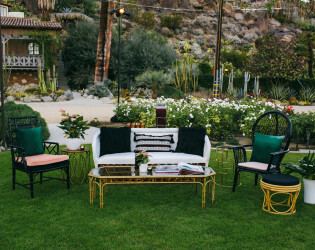 The adjoining outdoor patio is a perfect location for a cocktail hour. 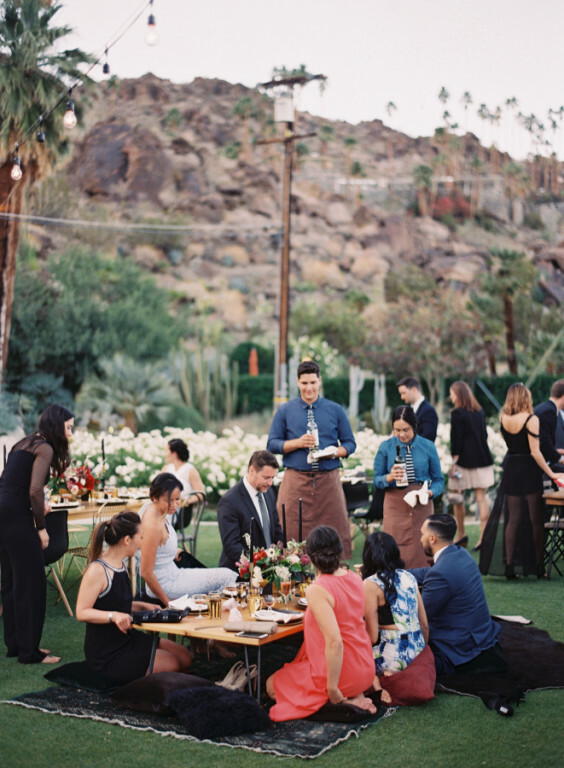 In addition to the venue space, there are on-site, overnight, accommodations for up to 26 people. 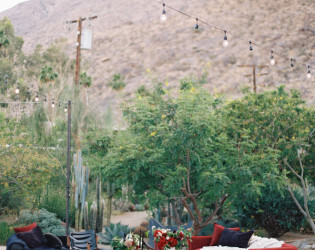 11 poles around the reception venue with hung carnival lights that illuminate the reception. 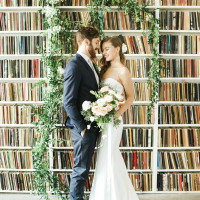 What happens when you combine a quick change of venue with a couple that's as effortlessly cool as they are unique? 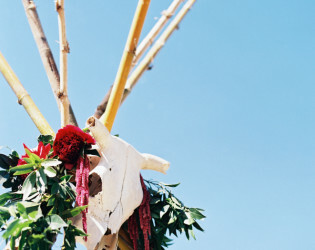 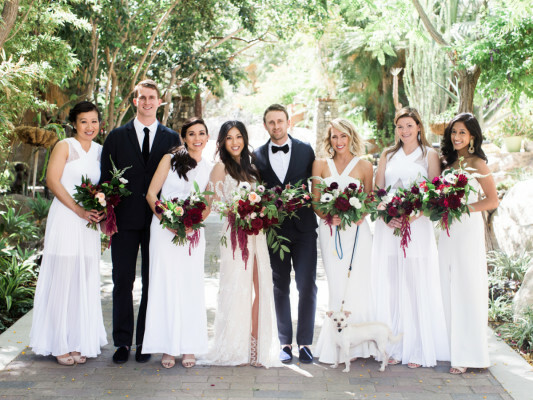 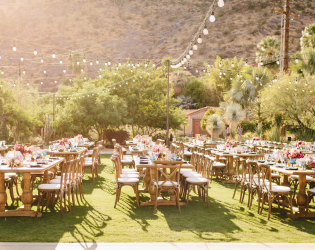 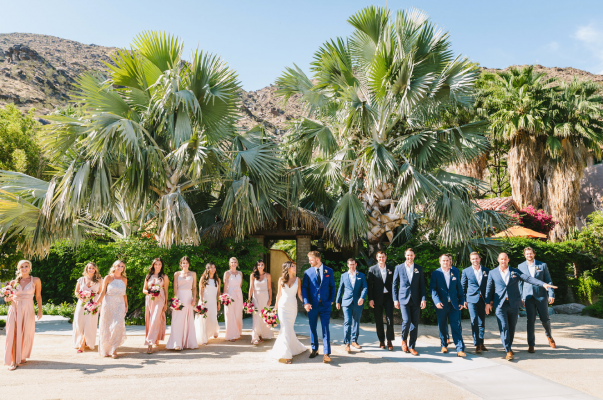 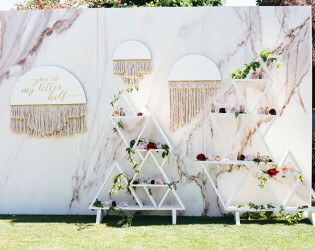 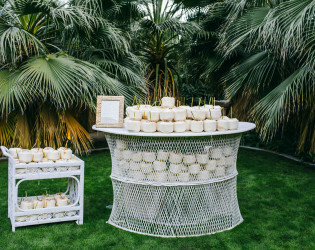 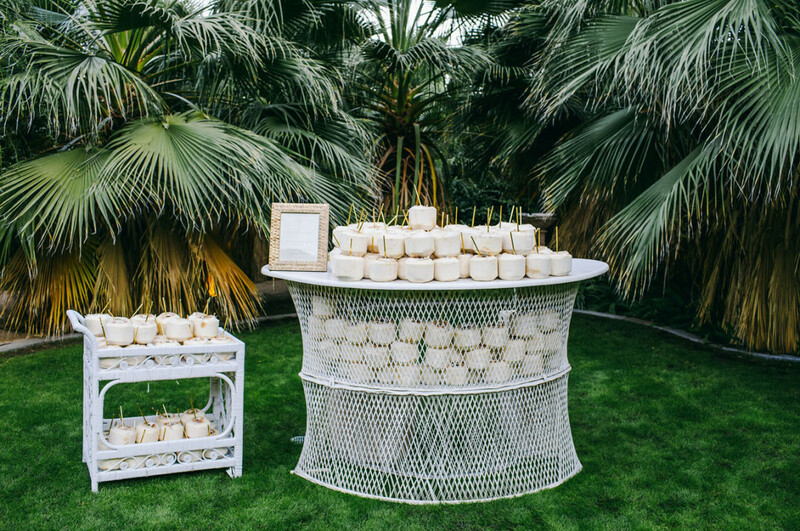 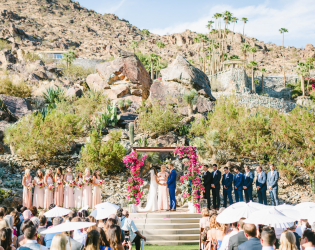 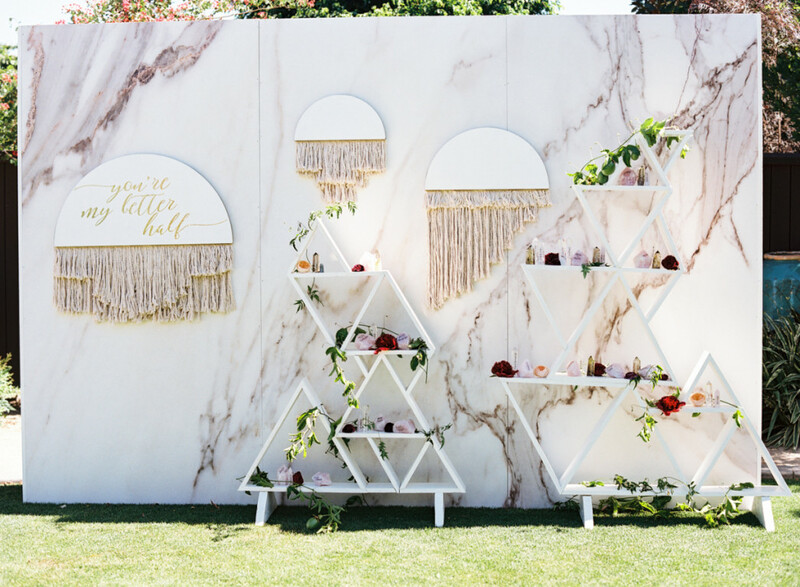 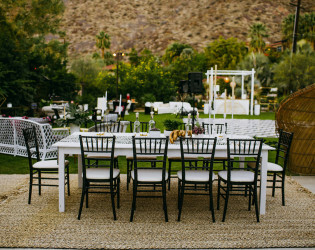 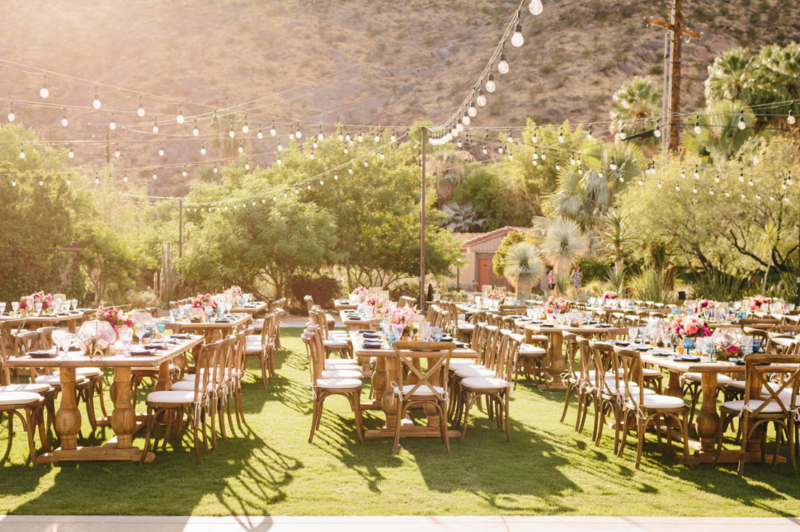 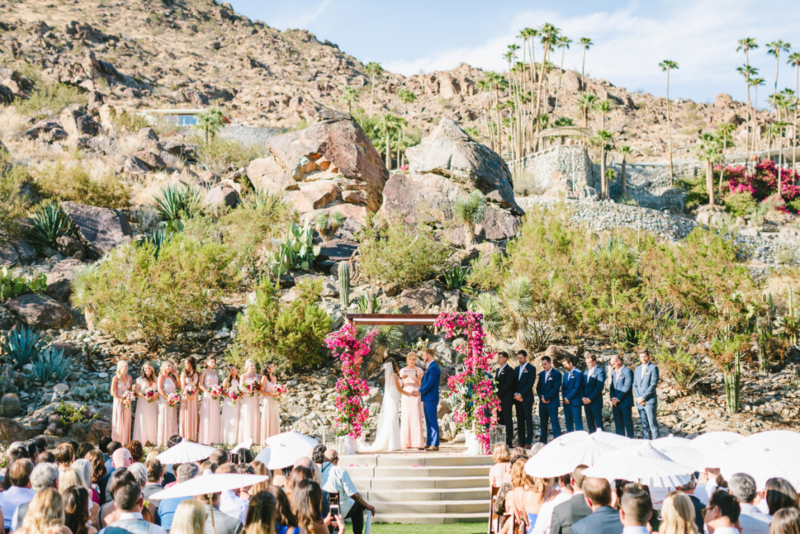 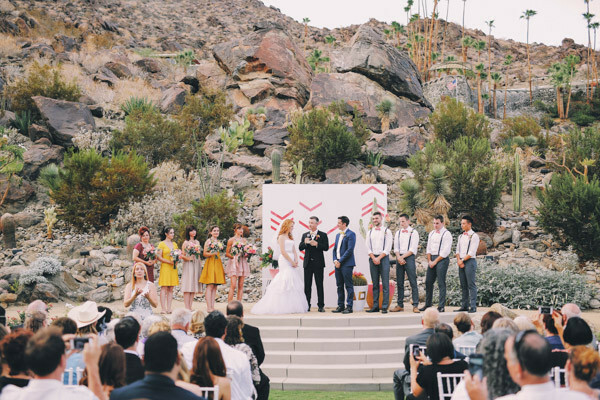 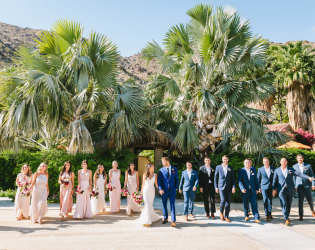 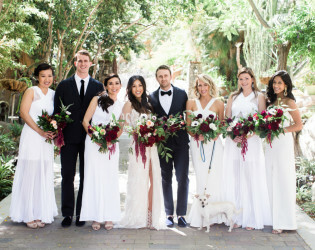 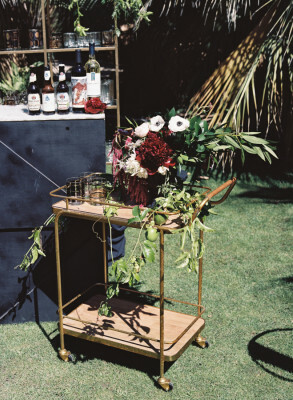 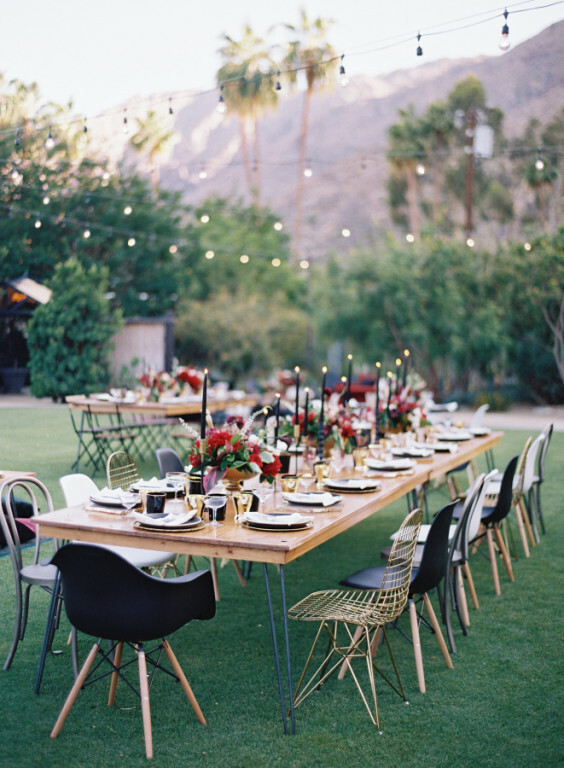 You get this modern bohemian wedding at Colony 29 in Palm Springs designed by Amorology Weddings. 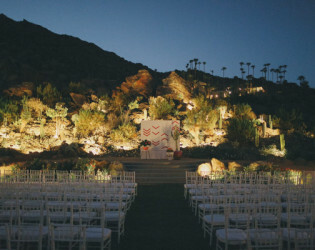 Sometimes last minute really is the way to go. 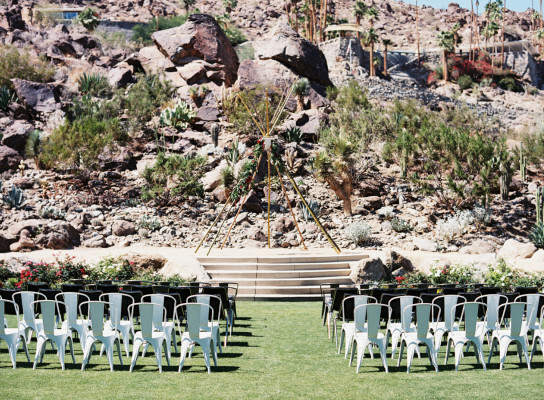 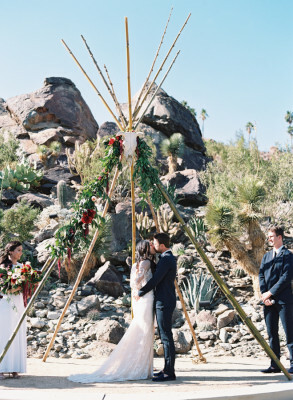 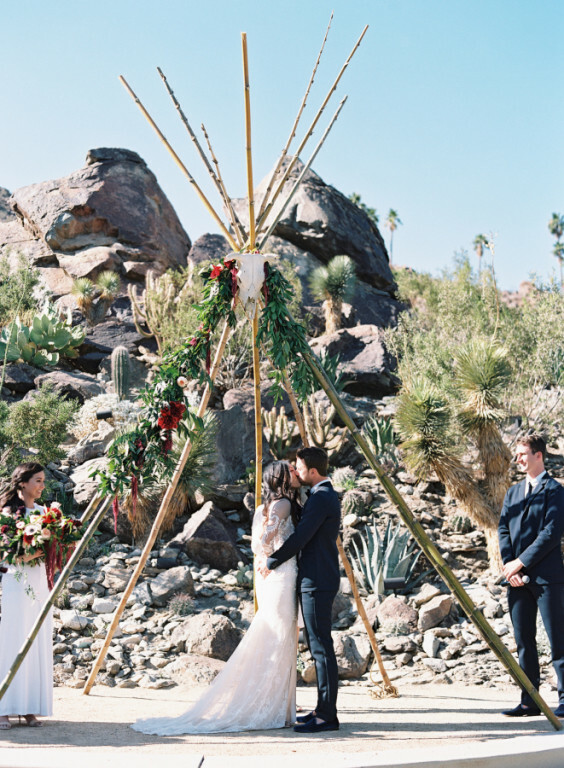 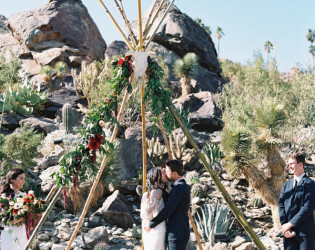 A naked teepee, black candlesticks, gold accents and jewel tone decor set a romantic mood against the natural landscape of Colony 29’s lush desert grounds. 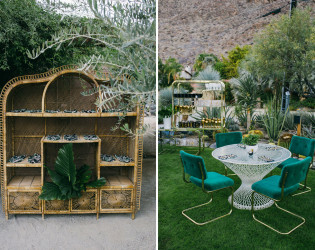 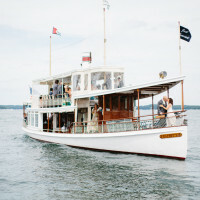 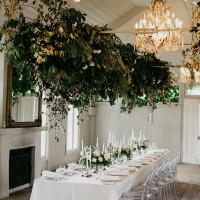 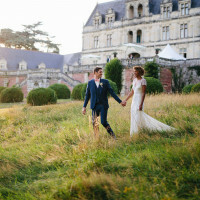 Feel the intimate and enchanting vibes of this wedding for yourself! Something tremendously novel and exciting has descended upon the picturesque Palm Springs landscape. 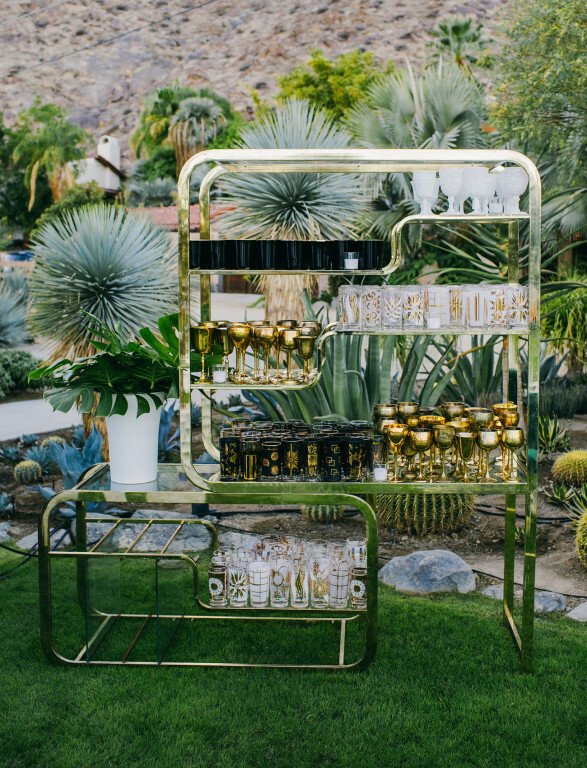 Over 60 different species of botanicals abounds around the property. 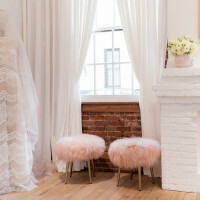 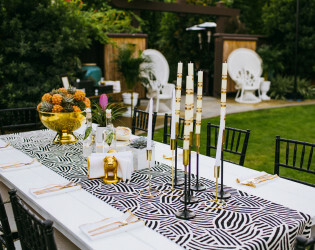 Modern/Glam Wedding at Colony 29. 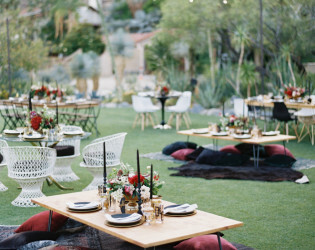 Mixtures of high and low seating. VIlla Amalfi is one of 6 villas you and your crew can choose to takeover. 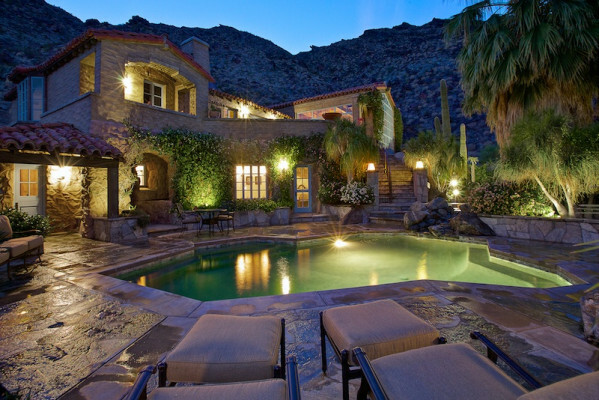 Stunning and set amid the amazing mountains. 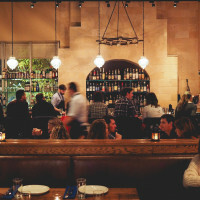 It's like having your own neighborhood - takeover it's entirety and you can also choose your neighbors. 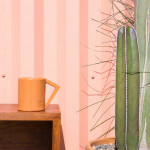 Painted desert paradise at Colony 29. 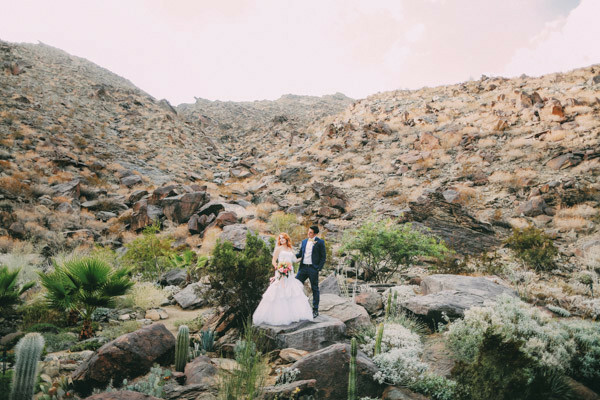 Beautiful desert backdrop for portraits. 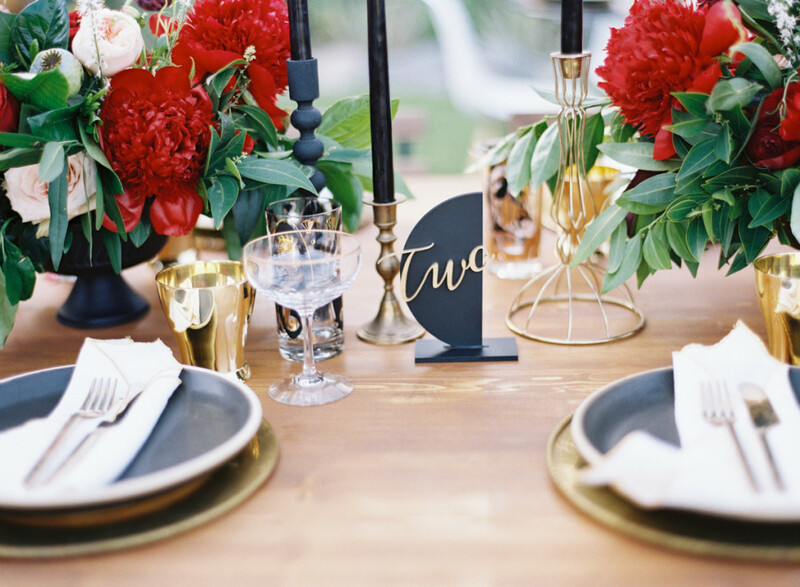 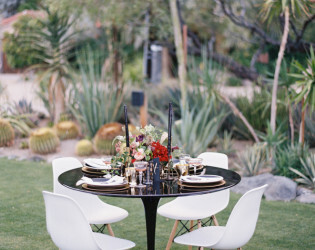 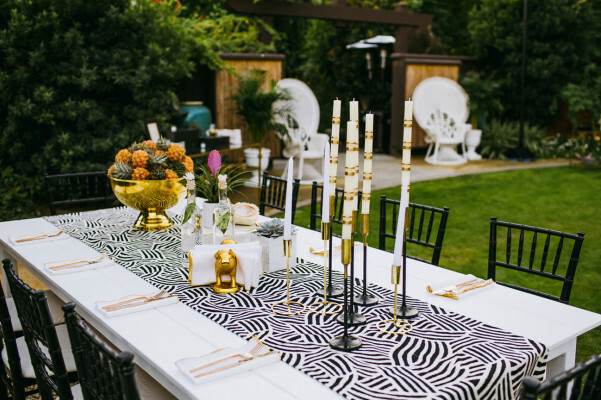 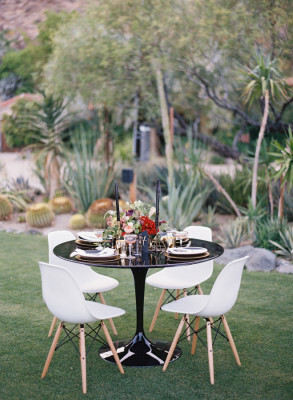 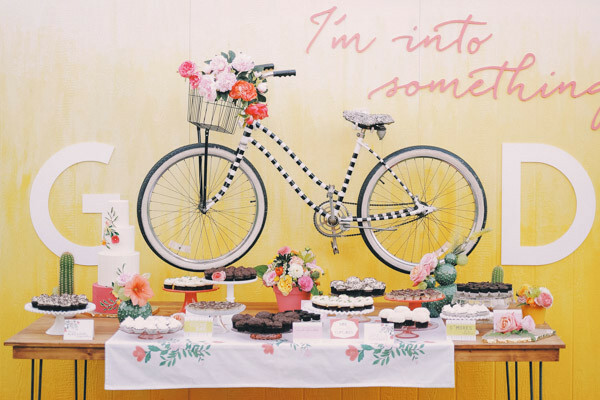 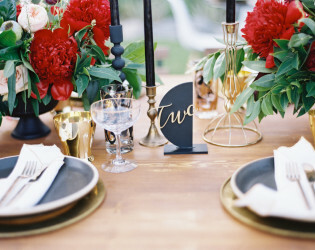 This sweet soiree setup is mid-century modern magic. 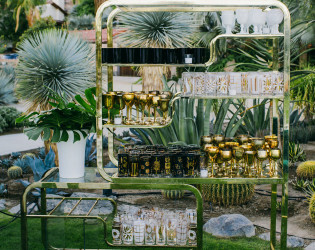 Gorgeous gifting station against the desert mountains. 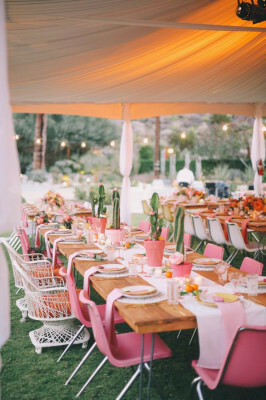 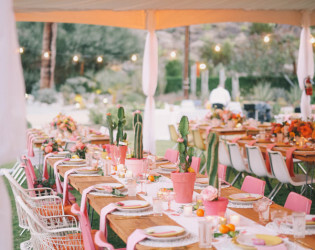 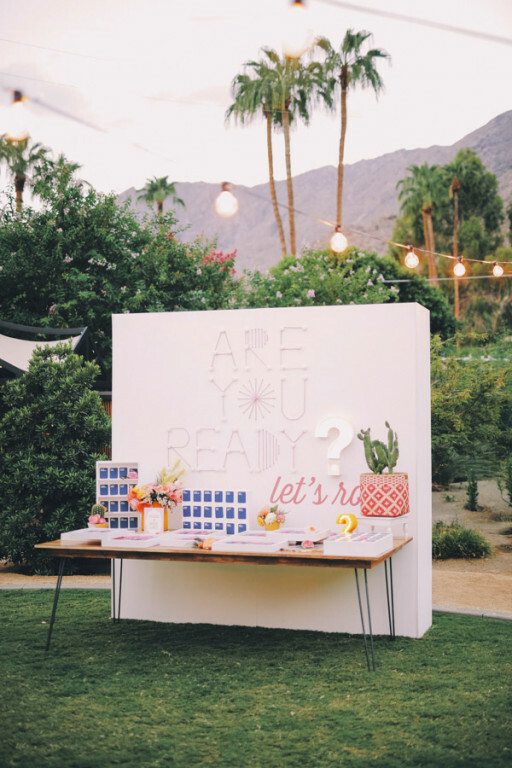 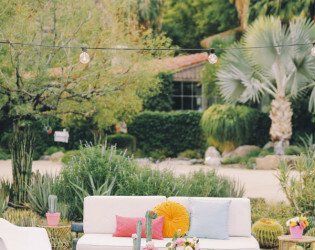 Perfectly pink and nicely neon for a modern reception in the desert. 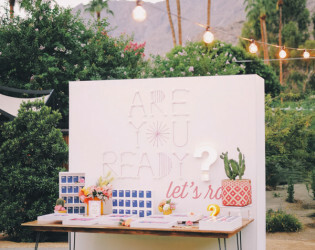 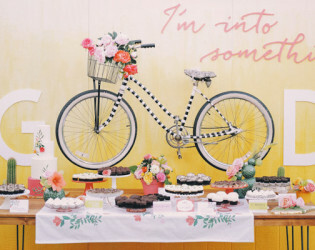 This wedding is full of whimsy and fun touches. 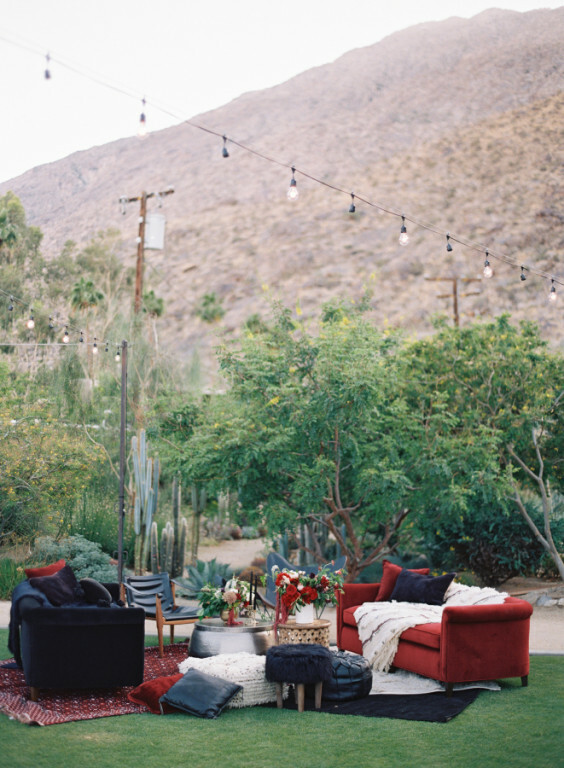 A starry desert night, setup.